I seriously cannot believe that 3 out of the 4 moms from MTV's Teen Mom have recently graced the cover of some of my most beloved magazines. 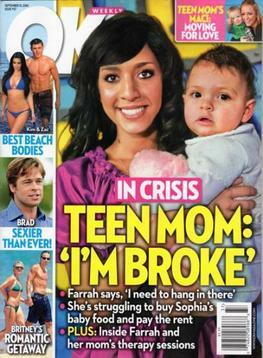 Surely, SURELY, there is something more interesting going on in the entertainment world than these too-young-to-be-moms. I admit to watching the show out of sheer boredom every week, but that does NOT mean that I respect myself for doing so. If I were a broke, insecure teenager and I watched this show, I wouldn't necessarily walk away from it knowing that it is hard and lonely to have a child when none of your peers do and you have no idea how to take care of another life. I would walk away from it thinking, "Damn, if I want to get famous and rich from magazine covers, I should go try to get pregnant from the local village idiot." Great message publications of America. But what has really got me heated is this week's cover of People magazine. 1) People, I know you're technically a tabloid, but I really thought you were better than this. 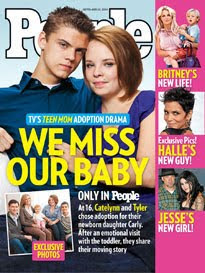 2) If you really want to be picky, Tyler and Catelynn shouldn't even be on the show because they aren't actually teen parents. The people they gave their baby to are parents, not them. 3) Finally, how long can one person have braces?! Catelynn...my advice to you, take some of that People money and find a new orthodontist because 3 years is too long to have that damn metal on your teeth. Notice how only the skinny mom's are on the cover and the only set of plus size parents is no where on any of the covers? I admit, I watch this show. Good point! I was wondering why Leah and Gary where MIA on all the covers.